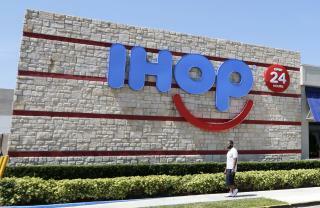 (Newser) – First it was International House of Pancakes, then just IHOP, and now … IHOb? A cryptic tweet Monday from the restaurant chain notes a coming rebrand, though it's not saying what the "b" stands for; that reveal will come on Monday. "We're serious about the quality of food and our menu, and this name change really reflects that," a company spokeswoman tells USA Today. A company rep also confirmed to the New York Post this isn't a goof. International House of Bypass Surgery? My guess is a grab for the upper crust with "boutique or bistro." I stopped going there years ago when they lost their "regular Joe" feel. ....and the one on Chandler Street in Worcester closed. Probably no one on this site remembers that... or when all the International House of Pancakes resturants were all A-Frames. Following Starbucks lead, "International House of bathrooms".